My goal is for the boys feel at home when they get here, with everything from a water fountain, litter boxes, and food dishes to the bed quilt being what they expect. The bed quilt Katherine shipped to me last last week; the rest I can buy duplicates of. The boys fly coast-to-coast this week, so it was time to visit the local Pet Co for those basics and more. As a side note, Pet Co sells only supplies for cats and dogs; they doesn't actually sell the pets. Instead, they support pet adoptions. In Massachusetts the local agencies bring volunteers with adoption candidates to the stores during the weekend high traffic hours. 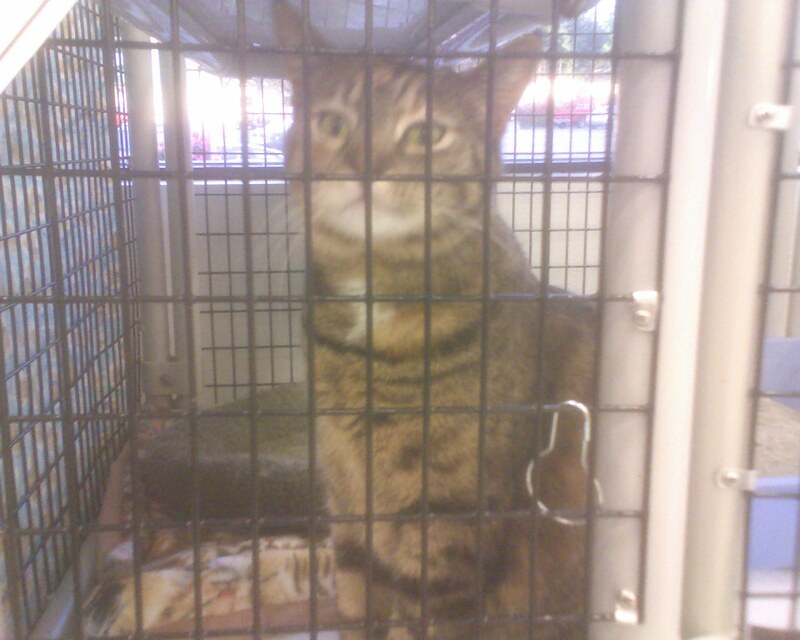 Here in Washington, at least for adult cats, they do it differently with a few cats kenneled right at the store by the rescue organization. Which is how I met Patty Cat last night. She really tugged at my heart strings; she is a Catzilla sized tiger about the same age as the boys, but with the color hues and affectionate gestures of our departed Emilyness. She made me sad, because we can't take her. Our first responsibility is to the boys, and with all us in temporary housing for a couple of weeks and then adjusting to the permanent Kitten Farm West, we will not want to add a new cat to the mix for months. She's also the wrong age, as we would not want all three growing old (and all that entails) together. But please consider this a PSA for your local animal shelter, which always has the pefect sister or even canine cousin of Patty Cat for you. That's how we got Bootsies. A local pet supply chain gives space to the Humane Society for adoptions. Here's hoping Patty Cat finds a loving home soon.